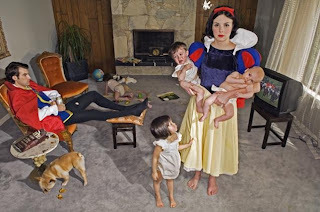 Ever wonder what happens after “happily ever after”? Photographer Dina Goldstein has created this photo series, chronicling some possible real-life struggles (obesity, plastic surgery addiction, motherhood) of our favorite Disney princesses. So next time the little girl in your life asks to go to Disney, you can now go ahead and provide her with a healthy dose of reality instead.